The University began preparing the Water Supply Emergency Contingency Plan following concerns about the University’s impact on local rivers; especially during low-precipitation periods. In February 2007, UConn sent the draft plan to the CT Water Planning Council. The plan identifies key areas in which the University and the local community can improve water conservation efforts throughout the year, as well as outlines specific responses for all water users during various levels of drought conditions. The Water Supply Emergency Contingency Plan also specifically lists action plans for consumption areas ranging from voluntary water conservation practices to mandatory reductions and usage bans, depending on the priority use of water and drought conditions. These responses are based on the USGS station flow rate measure of the Fenton River. Specifically, the pumping of the Fenton River wells is scaled back depending on the response stage. 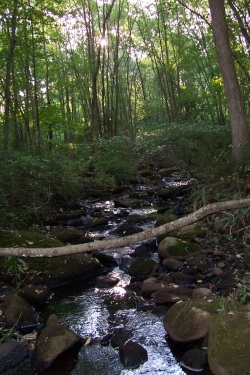 This comes directly from the Fenton River Study completed in March 2006. Click here to view the Fenton River Final Report. Some of these restricted uses include water use from: fire hydrants, irrigation, dust control, industrial cleaning and cooling practices, residential and municipal cleaning practices, water main testing and flushing, refilling pools, and washing vehicles. Finally, the Water Supply Emergency Contingency Plan details a recovery action plan depending on the trigger level of the water emergency. This section describes the time period and expected recovery levels required to remove the emergency level alert for the University and community. Click here to view the complete Water Supply Emergency Contingency Plan.